Summary: An important facet of The Turtle Hospital's work is the educational program. The Hospital conducts three tours per day for up to 30 people per tour, seven days a week, and plans to increase the number of tours per day during the heavy tourist season. The Turtle Hospital utilizes a PowerPoint presentation, brochures, and specimens to help in educating the general public and local school children regarding sea turtles, their plights, and the work The Turtle Hospital does to help the sea turtles. Turtle Hospital will print more brochures with updated pictures, add a life-size fiberglass leatherback shell to our specimens, and add educational bumper stickers to our educational materials. 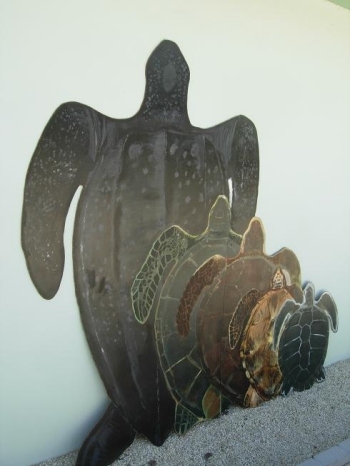 In addition, The Turtle Hospital will produce a life-size Sea Turtle Stand-up Display to demonstrate the size and pattern differences between the various species.